When Mr Lim Hock Leng was drawing up the master blueprint for his new luscious landed property in Singapore, he wanted a home cinema to host his guests and family members throughout the year. The home cinema would have to offer the best visual and acoustic experience that rival the best cinemas in town, complete with lush seats that make his guests feel welcomed. As with any cinema – whether it’s at public or private premises – the screen is often the centre of attraction, drawing viewers into imaginary and bygone worlds portrayed by movie directors, from the sights and sounds of prehistoric jungles to alien planets at the far edges of the universe. How that screen is powered can make or break the cinematic experience. While the largest LED TVs today offer screen sizes in excess of 80 inches, projectors can project an image of well over 120 inches, immersing viewers completely in the movie set more than TVs do. With a roughly 32m2 space big enough to host a cosy movie marathon, the choice of the Epson EH-LS10000 projector as the visual centrepiece for Mr Lim’s home cinema was a no-brainer. Aimed at home cinema enthusiasts looking for the very best in projector technology, the EH-LS10000 uses a dual laser light source to deliver the widest colour gamut and absolute-black contrast. Epson’s 3LCD reflective technology also delivers high contrast ratios, a high aperture for silky smooth images and high-speed motion response for crisp pictures in fast motion scenes. 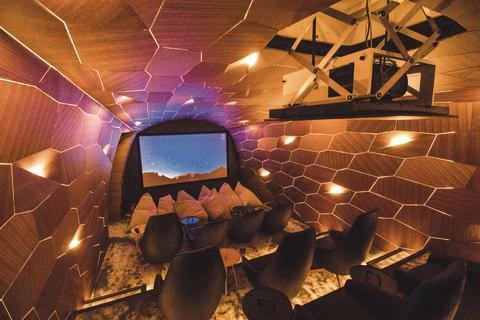 It took Singapore-based theatre specialist Art of Entertainment (AOE) and architecture and interior design firm PRODUCE six months to conceptualise and fit out the home cinema. Mr Lim’s home cinema features multiple modes that can easily be selected through a smartphone or tablet device to suit different usage scenarios, eliminating the need for multiple remote controllers. For example, a bright cinema mode reduces room brightness by half, while the living room mode fully lights up the home cinema. “Regardless of the movie I’m watching, the Epson EH-LS10000 delivers stunning images across different lighting conditions – absolute black in dark scenes, high level of detail and vibrant colours even when the room is not fully darkened. The projector has far exceeded my expectations,” Mr Lim says. Such image quality is only possible thanks to the Epson EH-LS10000’s high white and colour light output, and a 480Hz drive that ensures bright 3D images for those who enjoy 3D movies. It also supports 2D to 3D conversion and comes with two full HD Active 3D glasses for an immersive cinematic experience. Furthermore, the EH-LS10000 can also project 4K content, along with 4K enhancement technology that can upscale full HD 1080p content, giving users the high-quality and silky-smooth pictures of 4K. The EH-LS10000 is also Epson’s first home cinema projector to harness the power of high-quality laser technology, which not only makes it possible to project a picture at full brightness in just 20 seconds, but also sports a long-life light source of 30,000 hours in Eco mode. AOE’s Mr Lee says the use of laser technology reduces the need to replace projector lamps and maintain the projector. “We wanted to minimise the need for maintenance because the projector is stored in a motorised projector lift in the ceiling,” he adds. A wide lens shift range, powered optical zoom lens and lens position memory presets for several screen aspect ratios also make it easy to position and set up the projector all within a day, according to Mr Lee. More importantly, the projector runs almost silently with a low fan noise, and its sleek design, including a stylish lens shutter and hidden control panel, helps it seamlessly blend into Mr Lim’s home cinema. Mr Lim was looking for a projector that delivers bright and vibrant images across a range of lighting conditions in his home cinema. The projector had to be easy to use and maintain, and should deliver deep blacks with high contrast ratios. The Epson EH-LS10000 uses a dual laser light source to deliver the widest colour gamut and absolute-black contrast, while minimising maintenance and the need to replace conventional projector lamps. Its 3LCD reflective technology also delivers silky smooth images with a high level of detail.